Choosing a Realtor to represent you in selling your home is an important decision. 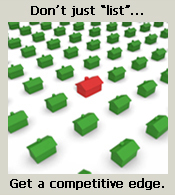 Not all agents are equal and you need someone who knows how to give you a competitive edge. I'm not merely going to just "list" your home, I'm going to get it sold through effective marketing, proper staging, followup, and hard work. Please read testimonials from my past clients. Value determination: Properly pricing a home is the foundation of successfully marketing it for maximum value. I will provide you with a comprehensive comparative market analysis (CMA) that will examine properties in your area that have sold, are sale pending, or are being offered for sale. As a result, you can expect an informed and objective opinion on the value of your home. Staging your home for sale: In order to sell your home for maximum value in the shortest amount of time, it is critical to have your home properly staged. I will provide you with a detailed list and specific feedback on how to best prepare your home for sale so that it stands out from the competition. Marketing: I am not an agent who merely wants to "list" a home- I am committed to marketing, following up leads, and do everything I can to get your home sold. I specialize in advanced Internet marketing that goes well beyond simply putting your home on a company website. Today's competitive market requires creative marketing. I will prepare a strategic marketing plan specifically for your home. Weekly showing reports: Every Monday you will receive a weekly showing report of who looked at your property and what the feedback was. This can be great information to get into the mind of how buyers are viewing your home and what improvements we can make. Following up every lead is a very important step trying to capture every potential buyer. Negotiation: With over 12 years of sales experience in the Boise, Meridian, and Eagle real estate market - negotiation is one of my favorite parts of the real estate business. As a full-time Realtor I have broad negotiation experience in selling homes, land, and commercial property ranging from $100,000 to almost $4,000,000. Real estate contracts/documents: I will help prepare and guide you through the documents involved in selling your home. From purchase and sale agreements, inspection addendum's, to closing statements- all the details of your transaction will be handled with skill and care. Find out the true value of your home and request a free, no-obligation, Comparative Market Analysis (CMA).